Those tall things are actually my trellises for cucumbers, beans and peas. They are made from 2” x 4” x 8’ cedar, ripped lengthwise (@ 1.50” x 1.50” square). Before I cut them I marked out in 7 inch increments starting from the top. AFTER I ran them through the table saw I picked my upright pieces and tapered the ends so I could drive them into the ground easier, then picked my top sections and drove in a 1” roofing nail at each 7” line, centered on the width, leaving about an 1/8” between the head of the nail and the wood to allow for the string. I then laid out my top pieces in the area I wanted to make my trellises and marked the spots for the uprights; my longest trellis is 15’ long so it needed a center post. I drove the uprights into the ground about 18 inches using a fence post driver that you use for setting chain link fence posts (available at any big box home supply store), leaving about 6-1/2 feet above ground. Then I put my tops on and secured them into the uprights with a 16 penny framing nail (NOTE: I made a simple lap joint where I joined the two uprights together for my longest trellis). Then started my string on the nail closest to the ground and worked my way across, wrapping twice around each nail and moving up a row each time; my horizontal string is one continuous piece of string. When I got to the last nail on the highest marked row below the top piece I tied it off. I then began the vertical string by cutting 7 foot pieces of string for each nail in the top piece, put a loop at one end that I hooked around a nail on the top piece and then wound it through the horizontal string wrapping once around each horizontal piece of string and tying it off to the lowest horizontal string. LESSON 1: After you wrap around the lowest horizontal string keep going and secure the loose end to a stake you drive in the ground. I didn’t do that with mine. 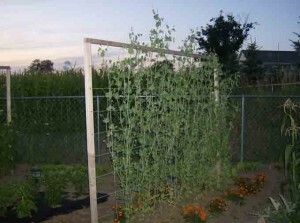 They have held up just fine, but if you “ground” them they will be much more stable, especially if you live a windy area (like by Lake Michigan); my beans and peas have mastered the “hula”. String: For the beans and peas I found a great bio-degradable string at my local hardware store (I think it was about the 4 lb. strength type) which has held up great, and can be decomposed into the soil in the fall. 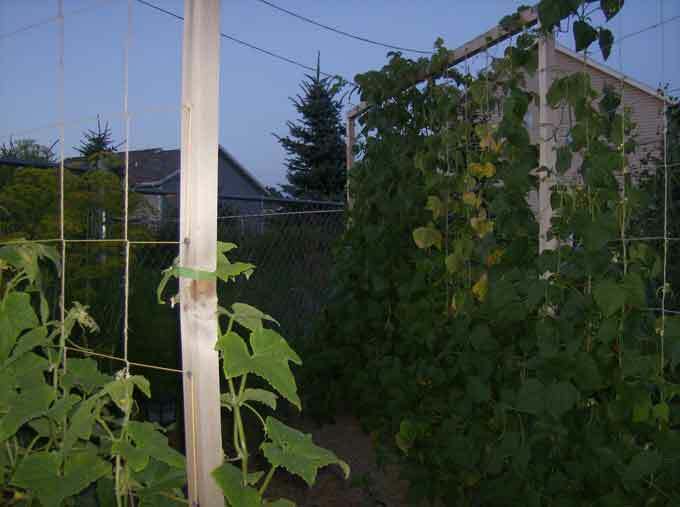 My horizontal pieces on my cucumber trellis I used yellow masons string which is rated much higher in terms of weight capacity and I’m glad I did ‘cause them cukes are getting heavy. I have read that some people use wire for their cucumber trellises or even chicken wire on a slanted growing trellis which I think I may try next year…I have discovered that you can teach a cat to sit a lot easier than you can teach a cucumber to grow straight upright, and my cat still won’t “sit”. 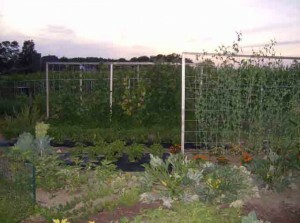 I put my trellises in BEFORE I sowed my seeds so I knew where to plant the seeds and didn’t disturb any underground growth, planted the seeds per the package directions, thinned as needed and then let them do their thing. Another thing I did in arranging my trellises was to create a “quiet space” in the garden that I can go to, pull out my tailgate folding chair, sit, relax and enjoy a cold adult beverage in amongst the beans, cucumbers, dill, fennel and carrots and you can even catch a whiff of the basil if the wind is right. This little area was something that my wife helped me create… we haven’t used it as much as we should have, but when I have it is a fabulous place to unwind. P.J. Scott is a beginner gardener who discovered the joys of a backyard garden this season and along with his family’s participation has managed to create a beautiful and productive new vegetable garden on his very first attempt. PJ writes about hockey on the West Michigan High School Hockey Blog and contributes occasional articles here at Veggie Gardening Tips. Wow Wee Wow! That is awesome and quite beautiful! One would never suspect that you are new to this ‘gardening thing’. You must have really done some research and planning. I am in awe. Thank you Kenny and PJ for posting this incredible follow-up and answering our questions. P.J., I love your garden, you have a real talent at this. Your photos are great too and we all look forward to reading the next “installment”. I am a second year gardener with just about 9,000 square foot of garden space. Some of my tomatoes reach heights of 7′-10′ tall so I have had to improvise some trellises as well. I used 8′ 2x4s as well but ripped them at 1″X2″ for the extra rigidity. some of my tomato plants are very heavy. Instead of the mesh wire across the span, I made sort of boxes for mine tie-ing a cross member across the top so I could ‘hang’ my tomato plants. I just figured out how to do this and had several bad ideas this year, I think I have something workable now for my wide row plantings. one ? Is it too late for me to start a fall/winter vegetable plant now? I did not do well this year, both my tomatoe plants died. I had so much weeding in my flower beds this summer. I ripped out some wild forest plants and planted grass so I hope next year it does not consume my weekends. I wanted to try to grow something this year if possible!